i can't put my finger on it but there's something about these watchmen pics that's just, i don't know... wrong. the owl-ship in the background looks nice though. i'll probably go and see it just because it's watchmen though, even if i think it's a bad idea. i'm curious to see what they do with dr manhattan. i'm assuming that they're going to cgi rorschach's moving-inkblot-facemask. 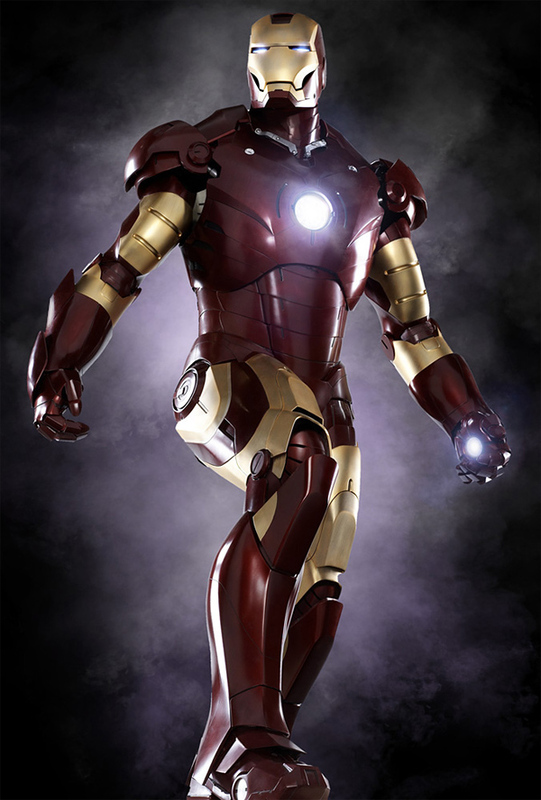 I watched "Iron Man" the other week and thought it was great fun. It's a little bit daft in the sequence when they're putting the first suit together but if you take that with a pinch of salt the rest of it is great. The final armour particularly is a thing of beauty. Fun for all the family. I went with my non-comics-geek sister and she thoroughly enjoyed it too so that's reassuring. What I am annoyed about now though is that I didn't stay to the end of the credits (I would have if I'd been on my own, cos I'm kind of tragic like that) and have since discovered that there is a little cameo after they've rolled. A r s e.
I mentioned this too a friend and he advised me that on IMDB you can check for stuff like this, which I didn't know, so it's a useful tip if there's ever any debate about whether it's worth staying through the 20 minutes of credit-crawl at the end on the off-chance that there will be 2 seconds of someone saying something cool or funny. Obviously you have to look it up before you go to see the film (unless you've got an i-phone or somesuch). Thanks for that. I tend to look at the trivia bits and goofs on imdb an all. However, beware of reading the goofs for any science-fiction films. It's like a nerd blackspot out there. I was at the cinema at the weekend and they had a little thing with footage from the new Pixar movie Wall-E. I haven't watched the trailer myself cos that tends to spoil films too much for me these days. Oh my gosh that looks brilliant. Try and make yourself watch it - it's ace! They've tarted the website up as well. Aces. 230 days to go. I hope he hasn't ruined it. I saw the trailer at the cinema this afternoon. There are parts where it looks ace - Dr Manhattan on Mars for example - but other parts where it still looks $hit - some of the stuff with the Comedian for example. Some of the backdrops look a bit rubbish. I think someone said that perhaps some of the effects shots would be worked up further before the release and obviously it's very much a teaser trailer and there's a lot of time for them to work on effects in the meantime. Nite-Owl doesn't look so good, and the Comedian just looks wrong to me - even though his costume is spot on. I don't know if they should have got an older guy to play him - perhaps they shouldn't have tried to stay so faithful to the look of him with his hair and cigar. It just looks artificial. I have reservations about them making the film but I'm sure it can be an entertaining enough if they do it right and if we don't let our expectations get carried away with themselves.